Batman Forever has been cleaning up really nicely. The game is in excellent condition, which makes my task easier. 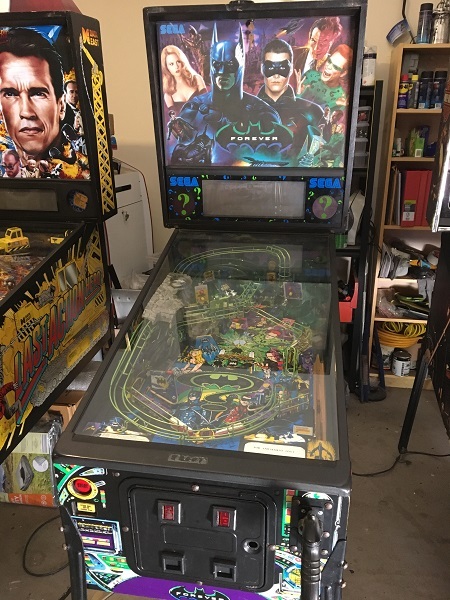 In this update, i’m now going to work through the last of the playfield assemblies so I can begin getting everything back together for a proper test. That means for this progress report, I’ll be covering the top playfield section. This includes the VUK, ramp diverter and three pop bumper assemblies. I already covered the orbit rail, saucer assembly and upper left and right playfield / plastics in a previous update, so won’t need to worry about those now. There’s a large ramp and rail that will need to be removed first, but from there it should be smooth sailing. Time for a quick update on the Batman Forever progress. 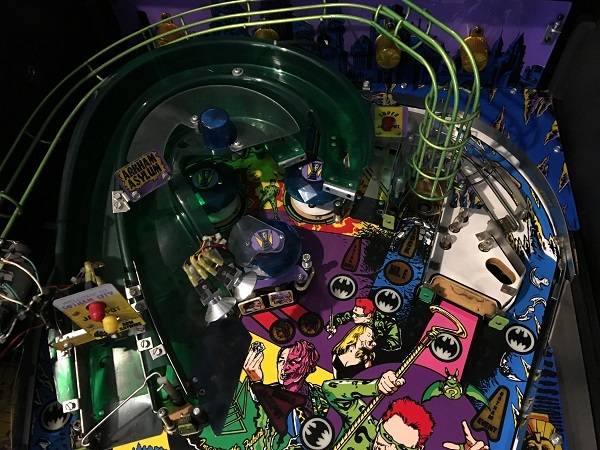 For this post, I’ll be focusing just on the assemblies and parts that form the playfield area. In general the area is in pretty good shape. 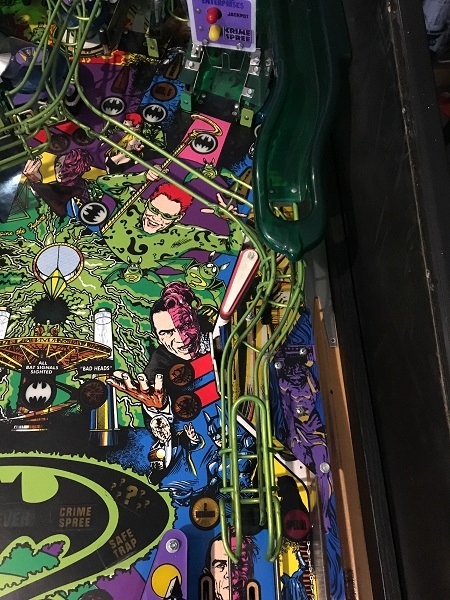 There are a couple of small mylar patches below where the ball exits the return rails that have helped protect against playfield damage where the ball lands. 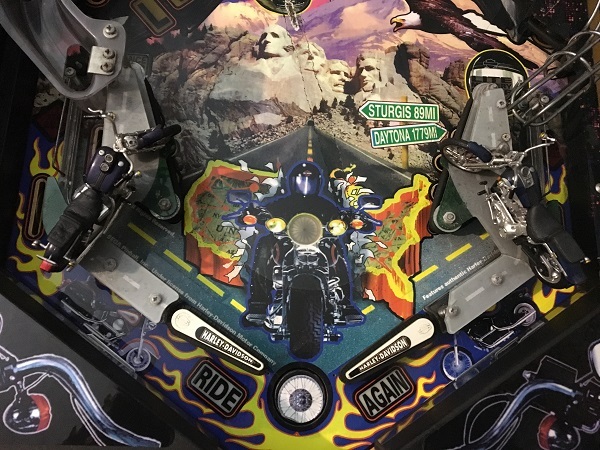 The playfield condition in the area is really nice, with a only few marks around the insert edges – but nothing anyone should worry about. The playfield surface needs a clean though to remove a layer of filth that has formed over the years. It’s not immediately visible to the eye, but when you run your fingers over the surface, you can feel it. The right slingshot has a small chip broken off the lower corner of the plastic, and the colours have faded somewhat on the left piece – but they are otherwise fine. Alright, let’s get to it. It has taken me longer than expected to advance to the next pinball machine in the queue. I did have plans for a short break after completing Harley (I still need to get around to doing the final write up), but a parts delay delay and sorting out a few mechanical issues at the end of that game ate up the gap I had planned. Sometimes, that’s how it plays out. The good news though, is this next game is one I’m really excited to be working on. It’s been raining SEGA’s here lately, with the next game up for a complete rebuild being a beautiful Batman Forever. It was released by SEGA in 1995 and roughly 2500 units were made. I don’t think SEGA games get enough credit and as a result, people miss out on some great fun. 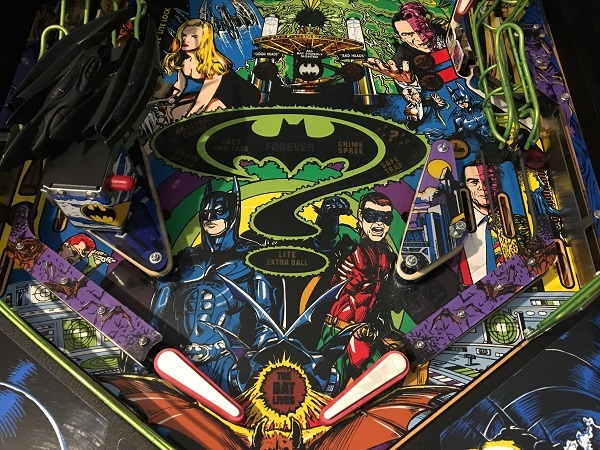 The game has plenty to offer players, serving up multiple ramps, rails, a diverter, 3 flippers, pop bumpers, targets, drop targets, a VUK, canon, Bat cave ball lock, large display (192×64), video modes and up to 6 players at once. The only thing it’s missing for me is a spinner. The game is also a widebody, but with plenty of things around the playfield, it feels filled to the brim. There’s even an easter egg hidden in the game – “After a certain number of slingshot hits, after a 3 second lag, a giant bat will appear on the screen and screech at you. If you hit the trigger then you will get 50M extra points”. I’ll have to keep an eye out for that one – easy points! There are a few issues that need to be sorted out along the way and I’ll go in to those as I work my way through the game. For the most part though it’s working well and just needs a good clean. Time to get started.